Are you staff washing their hands properly? Hand washing should take at least 20 seconds if you want to do a thorough job. 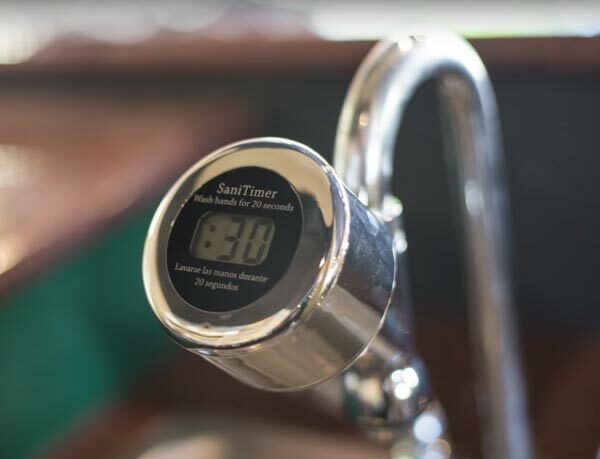 The SaniTimer installs easily on most kitchen taps and gives a visual reminder to give hand washing the time it deserves. It takes time to effectively clean hands but it is too easy for people to do a quick rinse and move on. Staff need something to slow them down and give hand washing the time and attention it needs. 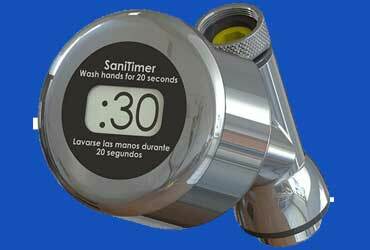 SaniTimer is a 30 second timer that is installed on the end of the tap, replacing the aerator. When water is flowing it will time down from 30 seconds to 0, and then gently beeps and resets for the next user. It’s not rocket science, but it is effective in getting users to focus on hand washing. To install your SaniTimer, just unscrew the aerator and replace it with the SaniTimer. Fits on any tap with the standard 55/64″ aerator thread. No plumber needed. Contains SaniTimer, tap thread adapter (sometimes needed), 22mm wrench for tightening, rubber seals and installation instructions. Why a 30 second timer? The US CDC and other health bodies recommend washing hands for at least 20 seconds. So why is the timer on the SaniTimer set to 30 seconds? That’s to give you time to let the water warm up, lather up with soap, etc, and still have a full 20 seconds of washing time. Need more Hand Washing help? 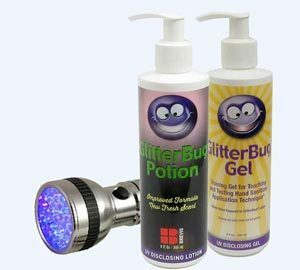 If you need another way to teach people about correct hand washing, check out GlitterBug Potion. It’s fun and interactive hand washing training that uses a UV light to show trainees the spots they’re missing. Great for all ages from kindergarten to nursing homes.